When you are pregnant there are many foods that you should and should not eat. This article will focus on the foods that you should avoid and safer alternatives. You should avoid consuming higher risk foods, especially if you are unsure of the hygienic practices that have been followed. The following information is directly taken from resources provided by doctors. There are many contradicting resources on the internet and for this reason alone I have ensured that I only provide information that I can be certain is correct and from professionals. The following food types should be avoided and not consumed during pregnancy. Cold Meats – Unpackaged ready-to-eat from delicatessen counters, sandwich bars, buffets, etc. Packaged, sliced ready-to-eat. Salads (Fruit and Vegetables) – Pre-prepared or pre-packaged salads from salad bars, smorgasbords, buffets, etc. Chilled Seafood – All raw such as oysters, sashimi or sushi. Smoked ready-to-eat and pre-packaged. Ready-to-eat peeled prawns (cooked) such as those found in prawn cocktails, as sandwich fillings and in prawn salads. Ice Cream – Soft serve. Cheese – Soft, semi soft and surface ripened chesses from delicatessens and pre-packaged, including brie, camembert, feta, ricotta and blue, etc. Other Dairy Products – All unpasteurised dairy products such as raw goats’ milk. The following are safer alternatives to the above high risk foods, these can be consumed instead during pregnancy, including precautions that can be taken. Cold Meats – Home cooked. Store in a fridge and use within a day of cooking. Chicken – Home cooked or Hot take-away chicken (whole or portions). Ensure the chicken has been cooked thoroughly and use immediately, storing any leftovers in the fridge and using within one day of cooking. Take-away chickens should be used immediately or stored in the fridge, using any leftovers within one day of purchase. Salads (Fruit and Vegetables) – Freshly prepared salads, homemade. Make sure all vegetables and fruit have been washed thoroughly, storing any leftover prepared salads in the fridge and used within a day of preparation. 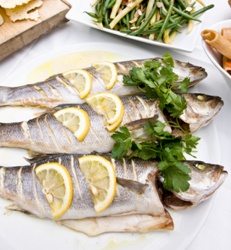 Seafood – All freshly cooked seafood, using immediately and storing any leftovers in the fridge to be used within a day of cooking. Cheese – Hard cheese for example cheddar or tasty, etc. Processed cheese, cheese spreads, plain cream cheese, and plain cottage cheese. Store all cheeses in the fridge and purchase cheese that has been packaged by the manufacturer not from a delicatessen. Other Dairy Products – Pasteurised dairy products such as pasteurised milk, yoghurt, custard, dairy desserts. Packaged frozen ice cream. Store dairy products in the fridge and maintain ice cream at the recommended frozen temperature. Canned and Similarly Packaged Foods – All ensuring that unused portions are stored in the fridge in clean, sealed containers and are used within a day of opening. Some foods contain a large enough number of bacteria to cause illness, affecting particularly vulnerable people such as pregnant women and babies. By following the guidelines listed above and avoiding high risks foods you will decrease your chances of contracting illness from contaminated food. By following some easy preparation and storage methods when handling food you should maintain food safety and avoid hazards during pregnancy. These include cleaning all utensils thoroughly especially between tasks and tasting. Always wash your hands before handling food and after going to the bathroom, ensuring any cuts and infections are covered. Defrost and cook all food thoroughly, especially meat and poultry. Don’t refreeze food that has already been defrosted. Never let raw meat or eggs come into contact with other foods. 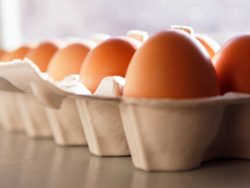 Eggs should be cooked until they are hard, do not have soft boiled or runny eggs. Reheat food thoroughly and only once, throwing away leftovers. Although fish is a good choice for protein for pregnant women, and is high in vitamins, low in saturated fat and nutritious fish oils; you should avoid some types of fish, such as shark, marlin and swordfish due to their higher mercury content and should not eat tuna more than once a week. Mercury can damage to your baby’s developing nervous system and should be avoided. If you have any particular foods that you are unsure about eating then it is best to avoid them until you can confirm their safety with your doctor or midwife. As previously mentioned, there are many myths and incorrect information regarding what is and is not safe to eat during pregnancy so all questions and concerns should be answered by your doctor.